With the rise of paid social and native advertising, more businesses than ever are promoting their own content to target audiences. The question for many of them is where to host some of that content. Company blogs are fine for some communications, but for promoted stories paid to run on content syndication networks like Outbrain and Taboola, having a consumer click a link expecting an article and then seeing a corporate blog instead can be jarring. In the fall of 2014, with Black Friday and holiday retail cycles on the horizon, AMD had exactly that challenge. They wanted to promote stories about various AMD technologies featured in Black Friday deals, but had nowhere to put it. 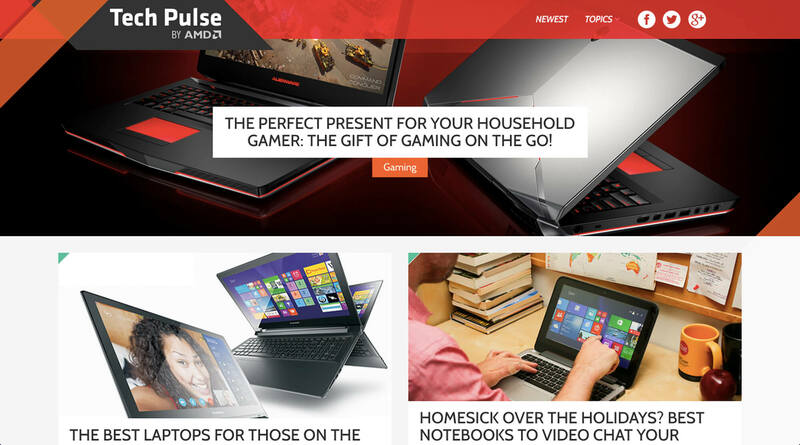 Over the span of a few weeks, Willis Collaborative built out AMD TechPulse, a new content marketing hub that looks far more like a consumer news blog, and less like a company website. Content can be searched, tagged and organized around a variety of themes, and it was ready to go just as Black Friday campaigns kicked off. Willis Collaborative built out AMD TechPulse, a new content marketing hub that looks more like a consumer news blog, and less like a company website.